In January 1869 the Roberts’ Opera House opened on Main Street in Hartford, Connecticut. 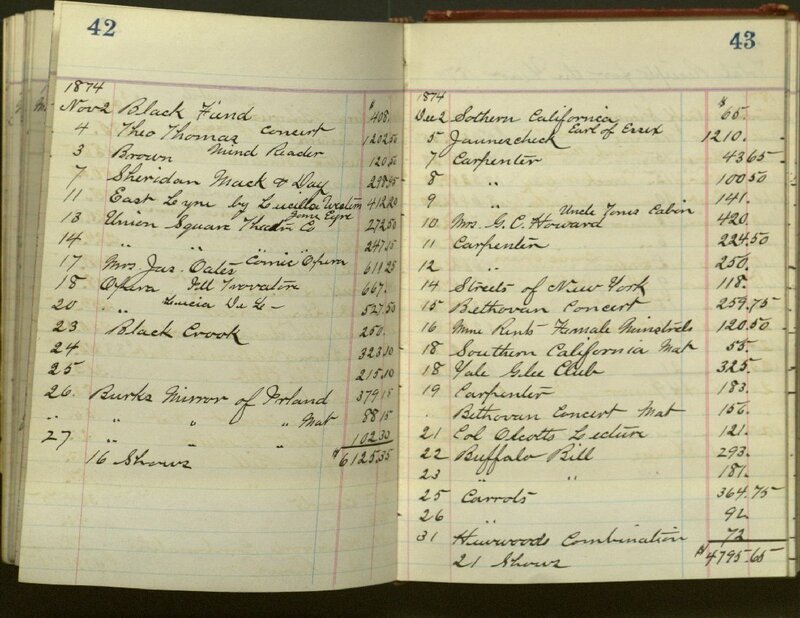 In an article announcing the event, the New York Times called it the “finest place of amusement in New-England.” Today I was cataloging a ledger with listings of performances at the Opera House between 1871 and 1886. Each entry includes the name of the performer(s) and the amount of money collected at each event. A variety of acts, lecturers, and other performance groups entertained at Roberts’. There were many minstrel acts, some from as far away as California. Readings, lectures, operas, and marionette acts also occurred. Over the years many performances of Uncle Tom’s Cabin took place. Operas, such as a performance of Don Giovanni, brought in the largest sums (over $2700 for a performance in February 1872). Most, though, would yield a couple hundred dollars. At only $50, the Mansfield Seance in May 1878 was one of the lower grossing events. 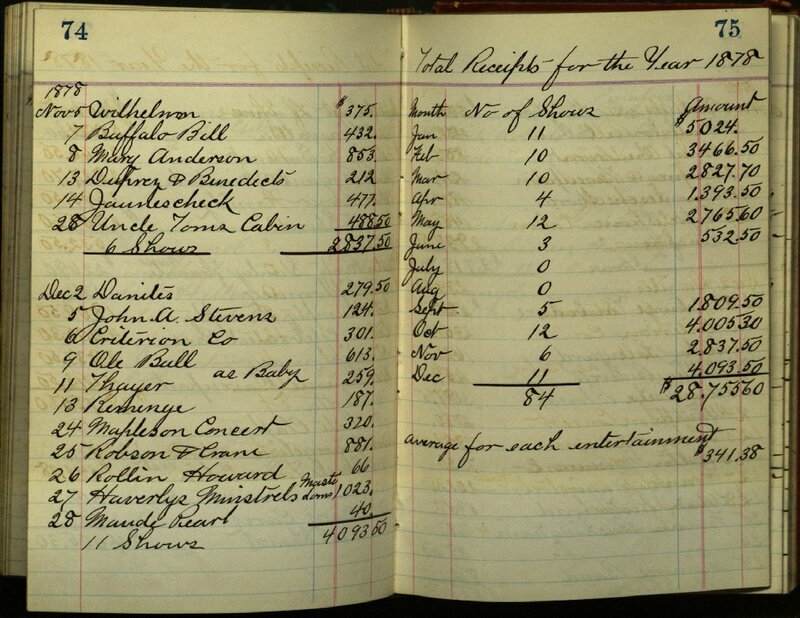 At the end of each year the total receipts were recorded, along with an average per show. Some well-known people and groups took the stage, including Buffalo Bill, the Yale Glee Club, and Henry Ward Beecher. Others are less familiar to us today, such as Maid of Columbia, Waifs of New York, and Schools for Scandal. Black Crook held many performances, but I only noted one mention of Barnum’s Aggregation. In the later years temperance lectures were held in the hall, and it was used more than once by the Catholic Society. A newspaper clipping stored with the volume lists performances from 1870, including a two-headed girl! If you are interested in researching amusement in Hartford, come visit! This volume is open for research. This entry was posted in Collections, Manuscripts and tagged amusement, Hartford, NHPRC grant project, theater by Jennifer. Bookmark the permalink.